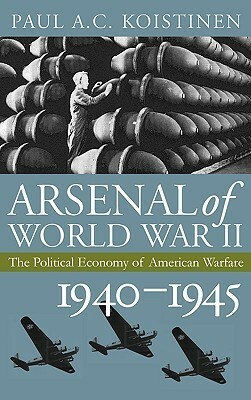 World War II – the era covered in this fourth volume of Paul Koistinenen's five-volume Political Economy of American Warfare – is the cauldron in which all the elements of the contemporary Military-Industrial Complex (MIC) combine into an institutional, military and economic whole. It was military production - production of weapons of destruction designed to kill millions – which dragged the U.S. out of depression. The scale of this military production was phenomenal. The level of military output demanded by President Roosevelt in 1942 "would total approximately 50 percent of the estimated GDP". To achieve this extraordinary output level, the War Production Board (WPB) "had to turn immediately to converting the civilian economy to war output" (p. 276). This economic achievement had deep political implications. "Relying on plenty for mobilizing a war economy had one fundamental drawback. Unmatched prosperity was brought about by direct and indirect spending for the armed forces. That acted to elevate an authoritarian military to a dominant power position in a democratic society and contractually tied it to the corporate structure". With the Cold War, "[l]arge financial outlays for the armed forces became permanent. The result was the military-industrial complex. As during World War II, that complex operated to the immediate economic benefit of most within the society. In the long run, however, it created profound problems for America" (p. 515).